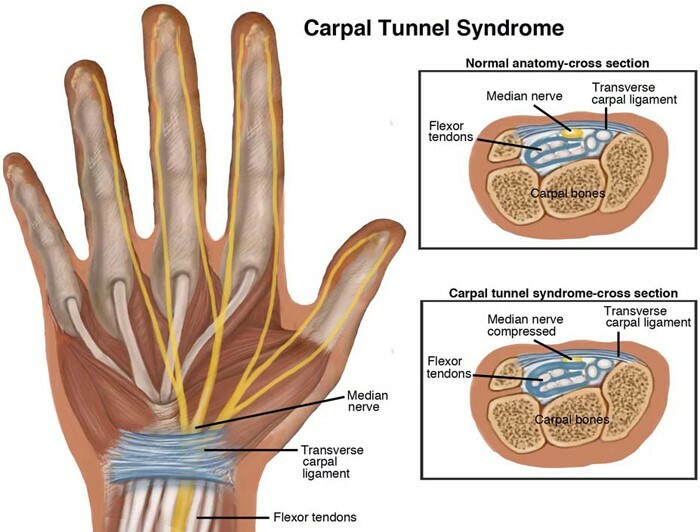 Carpal Tunnel Syndrome (CTS) can result from injury caused by an accident or automobile collision. The Carpal tunnel is the space between the bones and tendons of the wrists through which the median nerve passes. The carpal tunnel is the narrow passageway for the median nerve to run from the arm to the hand, and it is not much bigger around than the size of an average thumb. The median nerve is the main nerve to the hand. It runs from the forearm to the hand. CTS results when the nerve is compressed and causes numbness, pain and weakness to the hand. Pain may radiate from the wrist up the arm all the way to the shoulder, or it may radiate down into the palm or fingers. Weakness in the hands can occurs which causes a tendency to drop objects and problems with pinch and grip. Initial treatment modalities include rest, use of a splint to immobilize the wrist, and applying ice to the wrist. Medicines such as anti-inflammatories may be used as well. If conservative treatment does not effectively resolve the symptoms, then surgery may be utilized to reduce the pressure around the wrist to allow the median nerve to move more freely and to reduce the pressure on the nerve. This is called “carpal tunnel release” surgery. Following surgery, physical therapy and massage to the wrist is often recommended. It is rare for symptoms to recur, but they sometimes do.